It wasn’t a pilgrimage; it was more of a quest. I was searching for Martin Luther, visiting many of the towns in east-central Germany where he grew up, studied, and ultimately inspired the Reformation, 500 years ago. And I found him. Or, more accurately, I found them, many of them, for my quest uncovered multiple Martin Luthers – Martin the monk, Martin the musician, Martin the married man, Martin the marketing device, Martin the myth, Martin the anti-semitic monster, and still more. 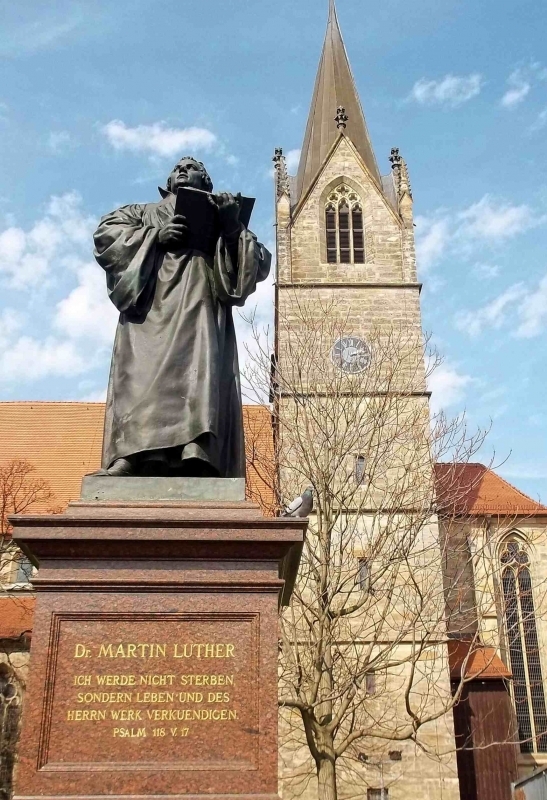 For as Germany – and most of the world where the Christian church has a presence – is celebrating the 500th anniversary of the Wittenberg Door incident (which may or may not have happened), Martin Luther is everywhere – and almost everything. 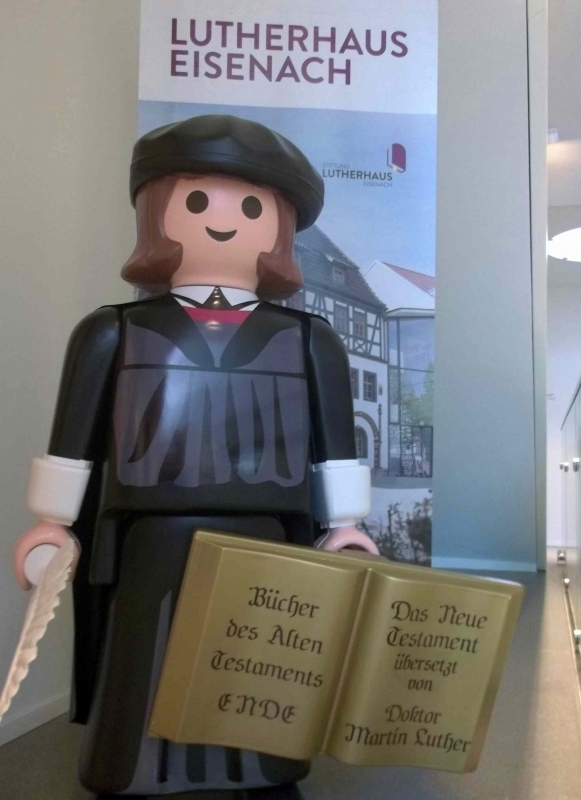 There are Luther exhibits, Luther tours, Luther cake mixes, Luther coffee, Luther beer, and a very popular Luther Playmobil figure, bearing quill pen and a tiny copy of his translation of the new Testament. And it seems the Christian church, right across its full spectrum, is on board. People of all denominations are making pilgrimages to Luther sites; even the Vatican has officially supported naming a public square in Rome after Martin Luther! Luther has always had broad appeal – and not always for the best of reasons. Of course, he has been a hero to most Protestant churches for five centuries, but he was also honoured as a revolutionary by the Communist rulers of East Germany (Luther lived out his life in centres that were part of the German Democratic Republic, from 1949 to 1990). And he was widely quoted by the Nazis, who cited his published harangues against Jews in defense of their odious “final solution” – the genocide that involved extermination of six million Jews. So the search for Martin Luther is a complex quest, indeed. Not surprisingly, the 500th anniversary of Luther’s 95 Theses has presented an unprecedented opportunity for tourism promotion, so many of the larger centres in Germany are offering significant Luther exhibitions – Berlin, Leipzig, Dresden and Frankfurt, among them. However, visitors wishing to connect with Martin Luther at a more visceral level should consider visiting the smaller communities associated with the man – places like Eisleben, where he was born, and where he died; Erfurt, where he served as a monk; Eisenach, and the nearby Wartburg Castle, where he produced his world-changing translation of the New Testament; and Wittenberg, where he taught and preached and shook the world by nailing a document to a church door. But where to start? Martin Luther was both a man of his times (born 1483; died, 1546), and a man very much ahead of his time. He led the Protestant church into a new era; he is credited with creating a common German language; he introduced an entirely new role for music in the church. He changed the face of his country, and of the known world. But he was also a man of the early 16th century. He and his wife survived an outbreak of the bubonic plague, in 1527. He lived in an era that saw witch burnings – and he did not protest. Government was alternately in the hands of monarchs, oligarchs, or leaders of the Roman Catholic church; democracy was utterly unknown. When rebellion against such autocracy arose, he opposed the rebels. This reality suggests that people trying to find Luther might do well to start by learning about his times. And an effective if unusual way to accomplish this is to visit two Panoramas, one created by artist Werner Tübke, in Bad Frankenhausen, the other in Wittenberg, the work of photographer and digital artist Yadegar Asisi. Panoramas are enormous, 360 degree artistic creations more common in Europe than in North America. These two are utterly unlike in content – yet both tell us a great deal about life in Luther’s time. Asisi’s “Luther 1517”, which opened this year – captures a day in the life of Wittenberg. As your gaze moves around the tableau, you gain a real appreciation for Luther’s world – the Elector of Saxony is riding into the town with his cortege; a priest sells indulgences; courtesans lure potential clients; an early printing press is in operation; monks turn away from the words of a protesting preacher; the church dominates the townscape; and in the distance, smoke arises from a fire in which witches are put to death. This experience gives context to the actions and impact of Luther; it fleshes out his milieu graphically and effectively. At the Tübke panorama, on the other hand, we were instantly immersed in the complex iconography and symbolism of Luther’s time. Tübke (1929-2004), created this work under contract to the communist state, in 1976. The original plan was to commemorate The Peasants’ War (1525), sparked by the radical preacher Thomas Müntzer, a contemporary of Luther. But Tübke believed he should portray much more – he accomplished a work that captures the overall turmoil in Germany – and by extension, Europe – of that era. His work is rich with the iconography of allegory, and is thus almost impossible to understand without a guidebook. But these mysteries are essential if we are to begin to understand the mind of Luther – this was an era where superstition, magic, and omens intermixed with theology. This was also a time when only a third of European adults could read, so while we today understand words but struggle with allegorical images, the people of Luther’s day understood images, but probably not words. We left the two panoramas knowing much more about Luther’s time, and also sensing how difficult it is to think like people of the 16th. But to get a more hands-on experience of life in Luther’s time – we went to bed. That is, we checked into the Augustinian Monastery in Erfurt, where Luther lived as a student, a monk and then a priest, from 1501 through the next decade. Today the Monastery is operated by the Lutheran church as a hotel and conference centre. Accommodations are simple – our room had two single beds, a desk, and a tiny wooden cross mounted on a large wall. It would be disingenuous to say we felt a definite connection with Luther in that room. But we were at least in the near neighbourhood. The monastery was founded in 1266. When Luther lived, prayed and studied here, there were 54 monks. It ceased to be a Monastery in the 16th century, thanks to the reforming zeal of its most famous alumnus. We visited several parts of the monastery that were certainly part of Luther’s life there – the cloister, the student rooms (next door to our own quarters), the monk’s sleeping room and cells. One cell is identified as Luther’s, but our guide, Dr. Reiner Prass, admitted that is a best guess, based on a note by Luther about the view from his cell. Still, that room felt like the best connection to Luther – until we attended a service in the Monastery’s chapel, still a Lutheran church. Services there are conducted in German – a language virtually unknown to my wife and me. But on this occasion, there was a large contingent of visitors from France, and a few of us who spoke English. So the service was conducted in German, French and a bit of English. We were lost during the Germany, but when we heard phrases in French (which we both understand) or the bits in English, it was like shutters being thrown back from a window – and I understood, suddenly, the response church-goers must have had when Luther’s reforms led to the mass being said in their own language, and when accurate translations of the Bible were available in everyday German. It must have been life-changing for them. Life-changing is a good phrase to apply to Luther – both as a biographical description, and as an assessment of his contributions to almost every part of society. I’m sure he would never have predicted the twists and turns of his own life journey. A wall in a modern section of Wittenberg’s Castle Church – of the famed door – sketches a tortuous time line. 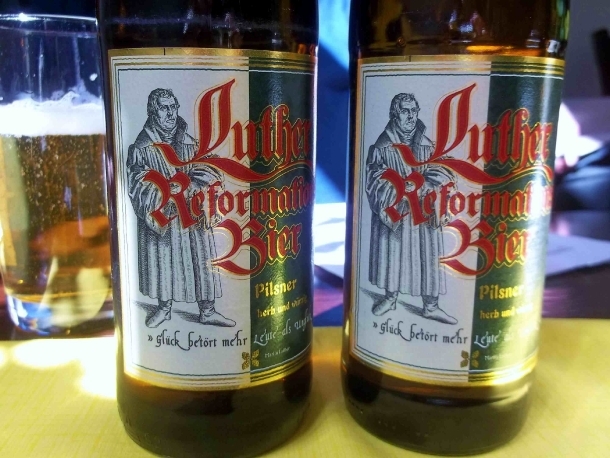 The first 34 years are so are less conflicted ­ – although Luther’s decision to become a monk, sparked by a nearby lightning strike, engendered conflict with his merchant father, who wanted him to join the family business. But, he became a monk, then a priest and lecturer at Wittenberg University, and by 1514 had become the Provincial Vicar of the Augustinian order – a successful career path for a member of the clergy in his era. But Luther was confounded by contradictions, both in his own belief system, and, as he perceived them, in the activities of the entire Roman Catholic church. As we walked the streets of Wittenberg, our guide, Sven Kröber, highlighted some of Luther’s struggles. Luther was obsessed with his own sin, and despite lengthy and frequent acts of confession and penance, was unable to find peace. Kröber quoted Luther’s own testimony that he was seated on a toilet “close to my study in the south tower” when he read John 3:16, and became convinced that the key to salvation was God’s grace; it is not earned by the works of human beings. Kröber pointed to the south tower of the former Wittenberg monastery, laughed, and suggested that, “God often uses the lowest places”. As church historians will tell us, this initial revelation of grace opened the door for Luther to challenge almost every practice of the Roman Catholic Church. He became convinced that people should be able to hear the word of God for themselves, so the mass came to be offered in the language of the people. His newfound assurance that “grace” was the key led to elevating the proclamation of the gospel – preaching – over the liturgy of the Eucharist; it also, in practical, design terms, led to the elevation of the pulpit to a height above that of the altar. 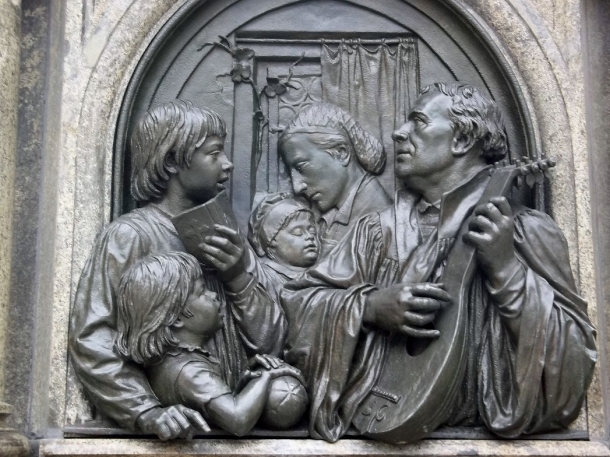 Luther was a musician; he played the lute, and it is a bit of a surprise to those of us for whom the typical image of the man is a rather dour painting of a serious cleric in black professor’s garb – to discover that most Luther sites in Germany display scenes of Luther playing a lute and singing with children. Yet we sing Luther’s words and melodies, including, of course, his masterpiece, “A Mighty Fortress”, without reflecting on the elements of his personality and his creativity this reveals. The flashpoint of Luther’s argument with the Roman Catholic church involved the prevalent practice of selling indulgences. The premise was that saints must have accumulated more virtue than they needed, personally; that the church was now the repository of those virtues, and could dispense them to believers, for a price. This flew in the fact of Luther’s new conviction that salvation was an act of grace, and he began to preach against what had become a flagrant practice in raising money for Rome via indulgences. This issue was at the heart of Luther’s “95 Theses”, published on October 31, 1517. The popular story is that he nailed them to the door of the Castle Church in Wittenberg. Like almost everything about Luther, this story is challenged by some scholars, and defended by others. But whether he administered a blow to a church door or not, Luther certainly hammered incessantly at the foundations of the church of his day. His revolution escalated; he was charged with heresy. At the famous Diet of Worms, he made his immortal declaration: “Here I stand. I can do no other.” Today, at many of the Luther exhibits, you can buy socks that bear that motto, in German or in English. The Elector of Saxony, Frederick the Wise, spent much time and effort trying to support the reformers while placating his Roman Catholic overlords. With Luther’s life in peril, Frederick arranged for him to be kidnapped – most probably with Luther’s knowledge, but unknown to Luther’s friends and allies. He was “imprisoned” at Wartburg Castle, near Eisenach – today a UNESCO World Heritage Site, visited by 400,000 people annually, while during the Luther anniversary, they are expecting half a million. There are myriad stories of the year Luther spent disguised as a knight named Junker Jörg, but his world-changing accomplishment while at Wartburg was the creation of a new German translation of the New Testament. At Wartburg, visitors can spend time in the small room served as Luther’s study. Here, Luther translated the New Testament and fought the devil – to Luther, a very real being and a constant tormenter. In a bit of clever whimsy, today there is a small figure of a devil suspended near the desk in Luther’s room. That Wartburg hide-away is the source of some of the probably mythological anecdotes about Luther. 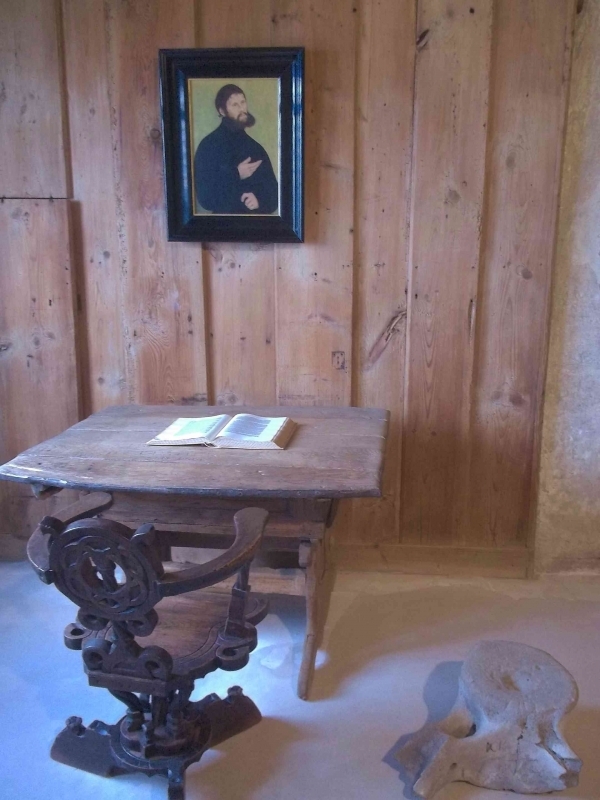 In that room was once an ink stain that storytellers linked to Luther’s declaration that he had driven away the devil with ink – which more probably was a comment on the impact of his writing and translation work. However, the ink stain kept disappearing, as visitors took home a chunk of plaster bearing the stain. Nonetheless, our guide at Wartburg, Henny Dobert, tells of many visitors who will swear to having seen the stain, many years after it was entirely removed. There are many Luther myths and stories, some arising from the years after his death, some much more recent. In fact, some of the sites well worth visiting in Luther country are themselves mythological. For example, Luther House, in Eisenach may or may not have been associated with Luther. As a young student, he apparently lived with the family that owned this house – but they owned a number of homes. Guides will tell you that, at least, Luther sang in a boys’ choir in the street in front of the building. Lutherstadt Eisleben is the town where Luther was born, and where he died. His Birth House is a fine Luther museum and, although almost all of the building post-dates Luther, there are bits of the original house to be seen. Our guide at Luther’s Birth House took great delight in the backstory. Martin’s father’s name was Hans “Luder” – a word she says is associated with prostitution (although apparently it can also simply be translated as “girl”) – so Martin changed it, often going by a Latinized version. Ironically, in years following, the home did become a pub and a place of prostitution, although it always had a plaque honouring Luther, by the front door. A subsequent owner didn’t like the juxtaposition of the great Reformer and the shady business inside, so he removed the plaque – and the building immediately burned. That’s one guide’s story of the Birth House. Our favourite mythological entity is Luther’s Death House, with the exhibit “Luther’s Final Journey”. The Death House is, simply stated, the wrong house. It was identified by records of ownership, and certified as a heritage site, but subsequent research revealed that the actual “death house” was another building with the same owner. We asked our guide about the true site where Luther died – and were surprised to learn it was a property now occupied by our hotel, the Graf von Mansfeld on the market square. Martin Luther left an incredible legacy when he died, February 18, 1546. He brought about irrevocable change in the church – the one institution that was a common presence in the medieval, European world. Every branch of the church was changed, from that day to this. He translated the Bible into the vernacular; he wrote thousands of words which were printed and disseminated throughout the land; he wrote music and introduced hymns-singing by the congregation; he eschewed vows of celibacy, encouraging priests, monks and nuns to marry – and did so himself. His marriage to former nun Katharina von Bora – well illustrated at the Lutherhaus in Wittenberg – was apparently a happy and surprisingly equal partnership. He also unwittingly inspired some of the great evils of the modern world. The communist leaders of East Germany used his image as a hero of revolutionary thinking. More appallingly, the Nazis quoted Luther’s odious, late-in-life writings “Against the Jews” to support their genocide. Our Wittenberg guide, Sven Kröber, led us to the side of the Town. High on the wall is a blatantly anti-Semitic sculpture, created 700 years ago – and therefore, in situ when Luther preached there. Kröber told us that Nazi soldiers would be brought to stand where we stood; they would learn that their views were supported by the writings of Martin Luther. Was Luther a hero? Perhaps not. Was he courageous? Yes. Visionary? Certainly. A man who revolutionized the world in his day, and for at least 500 years to come? Without doubt. And after driving 1300 kilometers, and walking many more on cobbled streets, castle staircases and church tiles, do we know Luther? Well, we caught glimpses of him everywhere we went. And those glimpses of a complicated human being who completely changed our world, were reward enough for our efforts.